Scène de l’Agamemnon d’Eschyle (Scene from Aeschylus’s Agamemnon), 1848. Barrias’s Second Rome Consignment (envoi de Rome) from the Villa Médicis. Housed in a period frame, with the cartouche, « F. Barrias » affixed to the lower edge. The present painting will be included in the catalogue raisonné of Félix-Joseph Barrias’s work in preparation by Marga Guëll. Félix-Joseph was the son of a porcelain painter and brother to the sculptor, Louis-Ernest Barrias. A pupil at the Ecole des Beaux-Arts Paris he studied under Léon Cogniet. In 1844, he received the institution’s highest honor, the Rome Prize, for Cincinnatus Receiving Ambassadors from the Senate. As part of the award, he was granted residence at the Villa Médicis for five years, from 1845 through 1849. Félix-Joseph Barrias had a long and prestigious official career, receiving a fist class medal at the Salon of 1851, the gold medal of the Universal Exposition of Paris in 1889, and for his paintings in the foyer of the Paris Opera. He became an officer of the Legion of Honor in 1897, and was teacher of Edgar Degas. 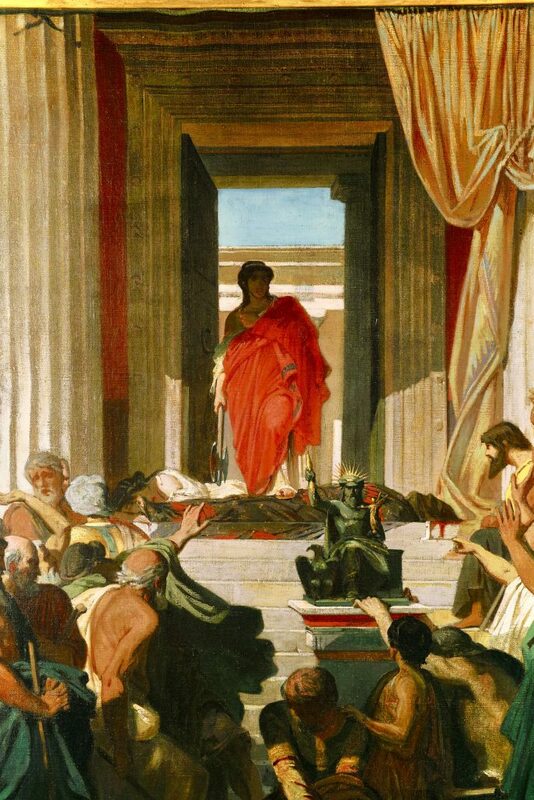 Barrias’s scene depicts a high point of Greek Tragedy from the first play of Aeschylus’s Oresteia Trilogy: the assasination of Agamemnon by his wife Klytemnestra. 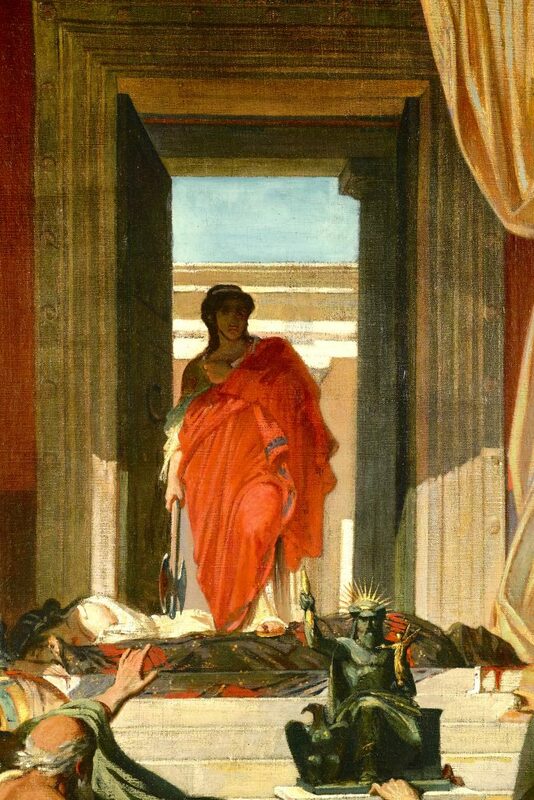 The hero’s body, bathed in a pool of blood, lies at her feet, as does that of Cassandra. Klytemnestra, draped in a red garment, still wields the axe used to slaughter her victims. 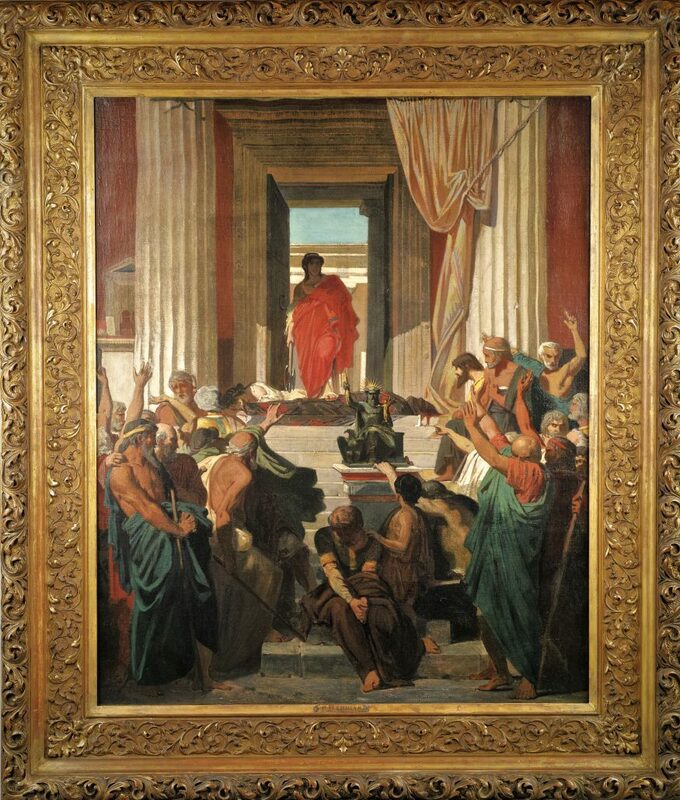 The crowd is in an uproar, and central figures pray at an altar erected to Zeus.